WHY YOU SHOULDN’T GET YOUR MEDICAL NEWS FROM THE MEDIA! To say that they are full of hype and sensationalism is a gross understatement. They are misleading and use scare tactics to increase readership. This is irresponsible journalism at its worst! We must stand up against this form of hype and demand accuracy from the media. This is why I try to use the original sources in my posts, although the science is often difficult to digest. Now, be selective with the news you consume and…Stay tuned! 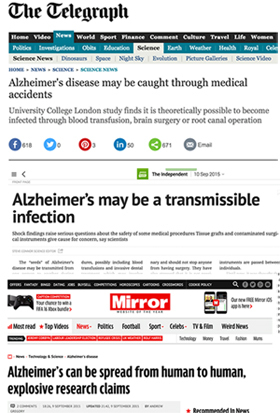 ** My note: I read these three as “Alzheimer’s disease may be caught through medical accidents; University College London study finds it is theoretically possible to become infected through blood transfusion, brain surgery or root canal operation” via “The Telegraph” on Sept 15. Sept 10 “The Independent” states “Alzheimer’s may be a transmissible infection; shock findings raise serious questions about the safety of some medical procedures Tissue grafts and contaminated surgical instruments give cause for concern, say scientists”. 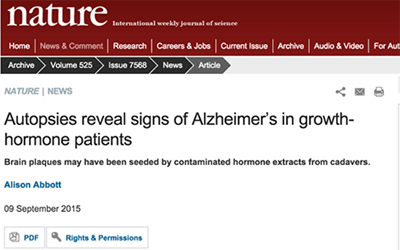 And Sept 9 “Mirror” states “Alzheimer’s can be spread from human to human, explosive research claims”.